Oil company Statoil has been found guilty of bribery and fined 20m Norwegian kroner (£1.6m; $2.9m). Norway's economic crime investigator Okokrim said consultancy fees were paid by Statoil to secure contracts in Iran. The consultant Horton Investment was paid $15.2m to "influence decision-makers in the Iranian oil and gas industry," Okokrim said. "Okokrim has... concluded that the agreement represented a criminal offence," the statement said. Former director of Statoil's international department, Richard John Hubbard, was also fined 200,000 Norwegian kroner, "or 20 days imprisonment in default of payment", for his role in the affair. But the case against former chief executive Olav Fjell was "dropped due to insufficient evidence". 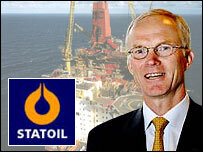 Last September, both Mr Fjell and Statoil's chairman Leif Terje Loeddesoel resigned over the affair. Earlier this month, an internal Statoil investigation into the affair revealed "ethical lapses". But the company's board insisted "there is no basis for criminal liability charges against either Statoil as an enterprise, or against individuals in Statoil". Both Statoil and Mr Hubbard must decide within 30 days whether to accept the Okokrim penalty. 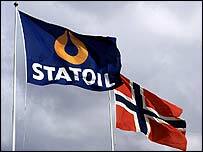 Statoil was found guilty under a law introduced on 4 July 2003. The law rendered illegal the agreement Statoil had with Horton, according to Okokrim. "Subsequent to this date, there existed a duty to terminate the agreement," Okokrim said. In the end, the agreement was only terminated on 10 September 2003 after the Norwegian newspaper Dagens Naeringsliv exposed the scandal. The saga has damaged Statoil's reputation, in particular in Norway where corruption is widely frowned upon. Moreover, "there is reason to stress that the investigation has not proved a basis for concluding that there was in fact any influencing of decision-making processes on the Iranian side", Okokrim said. This is in line with the findings in Statoil's own report which found that the man behind Horton Investment, Mehdi Hashemi Rafsanjani, son of former Iranian President Hashemi Rafsanjani, was not in a position to influence the awarding of oil and gas contracts to foreign firms. Indeed, one investment banker with extensive experience from doing business in areas where corruption is rife told BBC News Online the whole affair was much ado about nothing. "Fifteen million dollars over 11 years isn't going to buy a lot of influence," he said.